"The basis of building code development is to safeguard the health, safety and welfare of the public. Model codes have no force of law unto themselves. Only after adoption by a governmental agency are they enforceable…"2 Each state in the United States has a separate and distinct code adoption process. Many states have adopted various International Codes, but some states have their own building codes. New York State has adopted the 2003 edition of the International Building Code. The New York State Library has a collection of current and older editions of the International Codes, national model codes and New York State building codes. For more information on NYSL holdings, call the Reference Desk at (518) 474-5355 or send an email to refserv@nysed.gov. The International Code Council (ICC) was established in 1994 as a nonprofit organization dedicated to developing a single set of comprehensive and coordinated national model construction codes. The founders of the ICC are the Building Officials and Code Administrators International, Inc. (BOCA), the International Conference of Building Officials (ICBO) and the Southern Building Code Congress International, Inc. (SBCCI). The three model codes, the BOCA National Building Code, the Uniform Building Code and the Southern Building Code, were reformatted into a common format. The requirements in each model code for similar design situations were compared. After numerous drafts, multiyear reviews by the model code agencies and code users, and public hearings, the ICC published a single model code in 2000. The International Codes are "kept up to date through the review of proposed changes submitted by code enforcing officials, industry representatives, design professionals and other interested parties." 3 New editions of the International Codes will be published at regular intervals, usually every three years. The ICC also publishes volumes of Commentary that supplement the International Codes. Each volume of Commentary provides basic knowledge and facts relating to a particular Code and is meant to be used in conjunction with that Code. The Commentary includes a statement of the objective and intent for each section of the Code and usually includes a discussion about why that requirement commands the conditions set forth in the Code. “Effective January 1, 2003, the Uniform Fire Prevention and Building Code consists of several subunits each based on a model code developed by the International Code Council”.4 The subunits are Building Code of New York State, Fire Code of New York State, Fuel Gas Code of New York State, Mechanical Code of New York State, Plumbing Code of New York State, Property Maintenance Code of New York State and Residential Code of New York State. These publications, along with the State Energy Conservation Construction Code, are incorporated by reference in Title 19 of the Official Compilation of Codes, Rules and Regulations of the State of New York (NYCRR). These regulations contain the legally enforceable requirements for construction, fire prevention, energy conservation, plumbing and maintenance of buildings and structures. 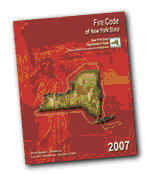 Current New York State codes combine language from the 2003 International Code volumes and New York State modifications developed by the State Fire Prevention and Building Council and the Department of State’s Administrative Task Group. In adapting the International Codes for use by the State of New York, certain sections, tables and figures were deleted and certain new text was added. These changes were intended to remove certain information not applicable within New York State, conform with statutory requirements of the Uniform Code Act and other legislation, and incorporate New York initiatives into the code. The New York State Library has current and older editions of the New York State building and construction codes. Listed below are the current editions of the New York State codes available at the New York State Library. Many of the older building and construction codes have been digitized and made available through the Library's Digital collections. The Library holds three copies of the New York State codes listed below. Copy 1 is located in the Ready Reference collection and must be used onsite. Copy 2 and 3 are located in the New York State Documents collection (D) and are available for loan. The New York State Library has a large collection of other current and older construction/building codes and related standards. Listed below is a sample of some of the codes and related standards available in the NYSL collection. (See also Standards and Specifications.) For more information on these items or other standards available at the NYSL, call the Reference Desk at (518) 474-5355 or send an email to refserv@nysed.gov. A Dictionary of Environmental & Civil Engineering edited by Len Webster. by Francis D.K. Ching and Steven R. Winkel. Wiley: 2003.
International Building Code. International Code Council: 2003. Building Code of New York State. New York State, Department of State, Division of Code Enforcement and Administration. International Code Council and NYS Department of State: August 2007.